Yes, we’ve been wondering about this for a while now… With so many options and alternatives around, why and when would Google+ introduce communities? Recently one of my colleagues told me, that it’s here… And immediately he created a few groups and invited me to a couple of them. I personally am not an avid user of Google+ as of now. Have explored it in the past and was there even before it launched to everyone. (Read: beta invites) But most of my time goes in tinkering around Facebook, Twitter and most recently, Quora. Yes, I shall of course write another post that’ll detail my passion and love for Quora, but for now, I’m pretty happy that communities on Google+ have been introduced. 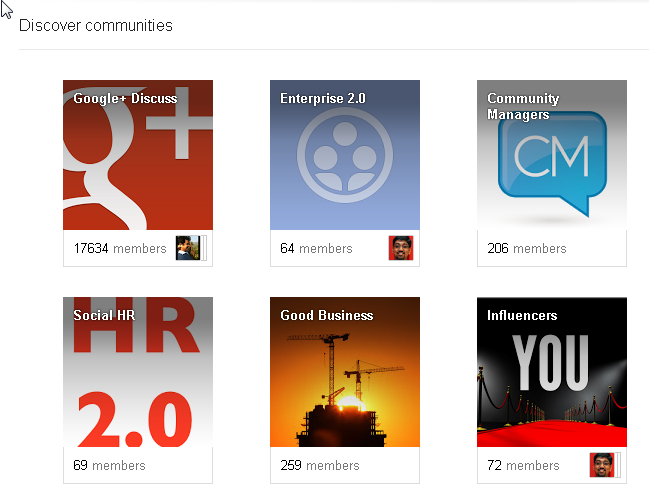 We all know, Google+ as a whole has a good level of traction from ‘The Geek’ community. Having said that, introduction of Google+ community is quite a blessing! Of course there are a lot of pros and cons about communities existing generally, but having said that one’s handling technology based websites, technology in general or for that matter niche groups and in fact product companies like SocioFi themselves… will appreciate the existence on Google+ for such a feature. I’d tend to say it’s a little different from what it looks like… One has to but agree that a lot of traction in terms of numbers is from Gmail as well. Also number of users vs. number of active users is a question one must answer. However, with the introduction of the Communities, aspect, the ballgame is a little different now, especially with Google+ having a Hangout feature, which can be explored well on the community front.